The organizing skills that got me, my wife and three others arrested, were the same skills that ended up saving our lives. “This is an illegal meeting! We’re going to arrest all of you!” shouted the district police commander as he burst through the door with soldiers wielding AK-47s. Despite 29 years in power, Ugandan President Yoweri Museveni and his top officials apparently still feel threatened when they hear someone is talking about peace, which is exactly what I was doing with a handful of women and youth in Lira, Northern Uganda on December 6. Personally, I never intended to take a deep interest in Uganda. I had met my wife Suzan, a Langi of Northern Uganda, while studying peace and conflict studies, as well as theology at Uganda Christian University in 2009. Once you fall in love, though, your life commitments tend to change. 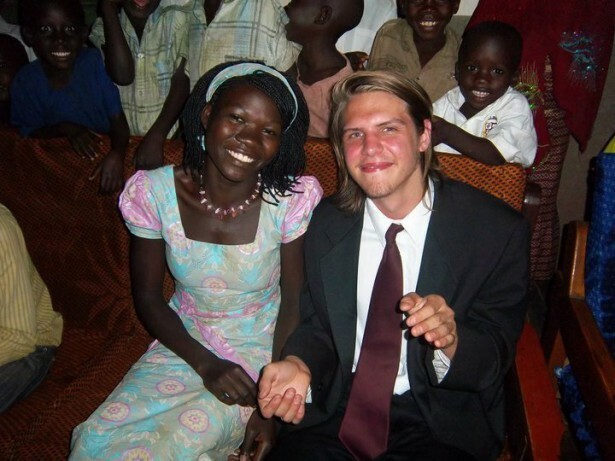 Suzan and I found ourselves quite drawn to her home region in Northern Uganda, and in 2012 we decided that if we were going to bring children into the world, we’d need to prepare a future for them — one in which they would be free from multinational corporations trying to take their land and military repression against freedom of speech. We resolved to occupy a once-unfilled niche in the social change circles of Uganda by opening up an organization dedicated to training people in nonviolent action, which we named Solidarity Uganda. Since 2012, our organization has worked to protect communities from corporate land grabs, monitor corrupt public officials and institutions, and advance peace and justice throughout Uganda. We do so by supporting local activists, grassroots groups and communities with training, funding and other forms of support. We are still unsure whether the district police commander knew we had gathered informally to discuss the issues affecting our community, namely the lack of financial accountability in local government, poor public service delivery and infrastructural neglect. However, to give him the benefit of the doubt, perhaps he received false information about the purpose of our meeting and acted recklessly. Regardless, we had not expected to be detained, tear gassed or threatened simply for conversing with one another. But we agreed to allow authorities to transport us (my pregnant wife Suzan, three male youths and me) to Lira’s Central Police Station, or CPS. Word of our arrest quickly spread throughout town. During the two-minute drive from the guest house where we were arrested to CPS, one of the youths, a local district councilor named Ocen, managed to inform the whole town of our impending detainment by yelling, “I must die for my country” from the truck at gunpoint. Despite a policeman’s request for him to stop shaming them publicly, he continued as onlookers tried to make sense of the scene. At CPS, we were asked to record statements while our phones, laptops and cameras were confiscated. We became reliant only on those who learned of our arrest and responded quickly. We gave them the phone numbers of our immediate relatives and friends who then reported to CPS to check on us as quickly as they could. Authorities placed us in a small cell that was made entirely of stone, with no mattresses, sheets, pillows or mosquito nets. Some of these cells held several dozen people with no room to lie down. We were forced to remove our shoes, and they gave us a basin for urination. Despite our request to place Suzan in our cell, she was taken to a separate room designated for females. We didn’t find out until later that word about our arrest had spread throughout town that evening. Local councilors, public servants, neighbors, family members and a few local media contacts came to visit us the following morning. There we more than 100 visitors that reported the following day, asking to see us. A few were permitted to enter, but most were prevented and even threatened with arrest. Once we had settled in our cell, we agreed our first objective was to get Suzan released. In Ugandan detention centers, only one plate of cornmeal and beans is served each day (and we weren’t about to eat food prepared by a government notorious for poisoning people). For a pregnant woman who went to sleep hungry, woke up hungry, and was forced to perform janitorial duties around CPS on an empty stomach, these conditions were not favorable. We succeeded in getting Suzan released after 24 hours in detainment by having her family members, including our young daughter and a former policeman, appear before authorities and request her release. Fortunately, authorities were primarily targeting me — since I was a suspicious foreigner in their view — and Ocen, who belonged to an opposition party. Ultimately, they likely realized it might lead to bad publicity if they were to detain the pregnant wife of an American for more than 24 hours. As soon as Suzan was able to get online, she posted messages on Facebook asking for prayers. Board members and friends of Solidarity Uganda came together and mobilized an emergency fund for the detained. This sent a message that supporters around the world were mobilizing financially. Solidarity Uganda’s network also informed the media in my hometown of Harrisburg, Pa., about our situation, and students and teachers in some public schools of central Pennsylvania wrote letters and called political leaders, the Ugandan Embassy in Washington, and the U.S. Embassy in Uganda advocating for our release. Since the U.S. provides massive amounts of funding for notoriously abusive proxy militias that Uganda sends on U.S. initiatives throughout Africa, driving a wedge between this tight diplomatic relationship was a welcomed opportunity. Once we knew we were going to be transferred to Kireka Special Investigations Unit — a facility feared for its reputation of torturing suspects with electrocution, physical beatings, exposure to human feces and other forms of physical and psychological torture — we informed everyone we knew about our transfer. Many loved ones assumed we were going to be killed. Some boarded buses to make the six-hour journey to the capital city. Others informed colleagues, human rights workers and lawyers in Kampala to go and visit us. TV stations also showed up, but were denied entry. Upon reaching Kireka late at night, we were happy to know the U.S. Embassy had sent personnel to check on my well-being. Although there was not much they could do for those detained with me, simply showing up to check on me sent a message to the Ugandan government that one of its major financial backers had eyes on the situation. Their visit also gave us some cause to believe we would not be subjected to physical torture like others detained at this much-feared “safe house” with us. I informed the embassy to work with my wife to track down a certain lawyer friend from Chapter Four Uganda, a respected group of human rights experts. By this time, word about our arrest and detainment beyond the legally-accepted 48 hours had spread across print and radio media in Uganda, and TV stations in my hometown were antsy to hear any news about me as well. Social media was buzzing. Thousands and thousands of people in Uganda and beyond were listening and watching. An important quality we developed within our imprisoned group was stubbornness. We refused to comply with less-than-adequate circumstances. After not being offered the opportunity to shower for days, we demanded that guards allow us to step outside and shower. There was a used condom floating in stagnant water in the tiny bathing area that morning, which could have only been used by one of the night guards. So we asked them to clean it. When they refused, we collected water and began cleaning the area ourselves despite their pleas for us to hurry. Demanding this basic sanitation was a way for us to keep our morale high. We then made phone calls from visitors’ phones and returned to our cells to eat the food they had brought us from the outside — both small victories unto themselves. While some Ugandans tend to be passive in the face of authorities, we always affirmed our rights as respectfully and firmly as we could. Our lawyer from Chapter Four Uganda finally arranged our release on police bond until we would be charged or have our charges dropped. As we were released, we were frustrated to learn that some of our friends, neighbors and colleagues were receiving threatening phone calls. A person close to my family was even snatched against her will from a public area and taken to CPS for interrogations. Since the phones they had returned to us were now tapped — in a very obvious and amateur way, I might add — we began freely sharing our personal opinions with those listening to show them that we are transparent people working for the common good. Activists sometimes back down from intimidation and psychological torture. But doing so, we realized, would actually make our lives worse in the long-run, causing supporters and friends to lose hope in a struggle that can be won. Using the money collected from well-wishers locally and in the United States, we planned a time for thanksgiving prayers — a celebration with traditional Lango foods to appreciate those who took care of us while we were detained, as is customary when someone returns home after experiencing a serious hardship. Since the district police commander had cited the Public Order Management Act — a law passed through Parliament without quorum that prevents any people from meeting for any purpose if authorities have not been informed — as a reason for our initial arrest, we decided to invite him as the guest of honor. This act, we hoped, would prove us excessively compliant with restrictive laws. But it also served several other purposes: It would show him that we had no bad will against him or the people of Uganda; it would gave him a chance to reconcile with us over food, a customary practice throughout most of Africa; and it would give us the opportunity to gift him with some pairs of slippers that could be used in the suspect toilets at CPS. We have realized that we need to be proactive if we want a community that is not policed by intimidation. Of course, authorities may be delaying to give us any legal charges because they know the circumstances they have put us through warrant serious legal repercussions and perhaps the suspension or transfer of top officers. In retrospect, the five of us who were detained have learned many valuable lessons about building a security culture. Mobilizing a diversity of community stakeholders, campaigning internationally in opponents’ donor countries, leveraging social media, advocating for the immediate release of women, demanding one’s rights, being publicly proactive about reconciliation, and utilizing (accidental) international accompaniment are just a few strategies that not only helped to prevent us from being tortured, but also exposed the violence inherent in repressive laws, practices and authorities. Although we are still on police bond, returning home to see my two-year-old daughter chasing chickens around the garden was probably the highlight of my life. And I will watch her chase these chickens every day until she decides upon another way to have fun. But hearing her laugh is a right I will demand every day until I die, if I must. This was an uplifting and inspiring story. It is good to know that people of courage and conviction are living in Africa to help create just countries.